Each DSCT36 potentiometer input transmitter provides a single channel of potentiometer input which is filtered, isolated, amplified, and converted to a process current output. Signal filtering is accomplished with a five-pole filter, which provides 85dB of normal-mode rejection at 60Hz and 80dB at 50Hz. An anti-aliasing pole is located on the field side of the isolation barrier, and the other four are on the process loop side. After the initial field-side filtering, the input signal is chopped by a proprietary chopper circuit. 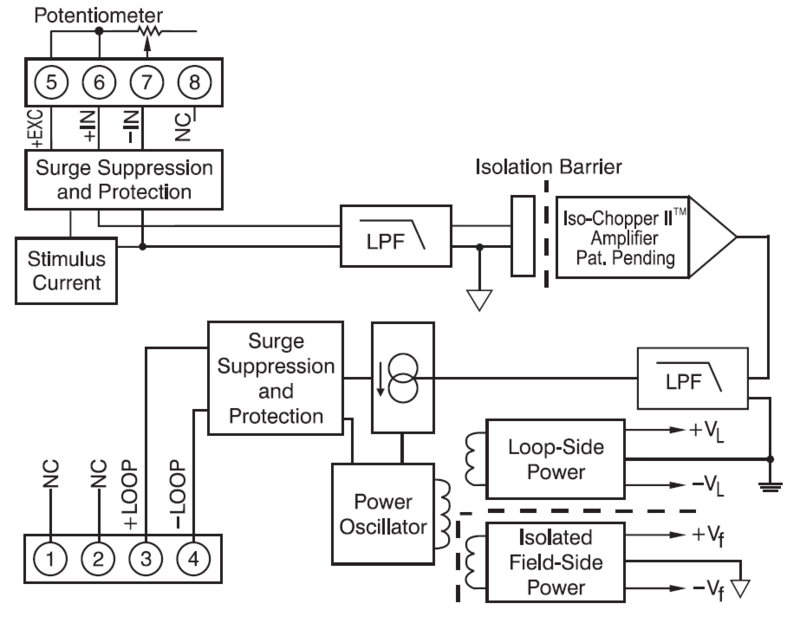 Isolation is provided by transformer coupling, again using a proprietary technique to suppress transmission of common mode spikes or surges. Potentiometer excitation is provided from the transmitter using a precision current source. The excitation current is small (less than 0.26mA) which minimizes self-heating of the potentiometer. Lead compensation is achieved by matching two current paths which cancels the effects of lead resistance. Special input and output circuits on the DSCT36 transmitters provide protection against accidental connection of power-line voltages up to 240VAC and against transient events as defined by ANSI/IEEE C37.90.1. Signal and loop power lines are secured to the module using screw terminals, which are in pluggable terminal blocks for ease of system assembly and reconfiguration. The modules have excellent stability over time and do not require recalibration, however, zero and span settings are adjustable up to ±10% to accommodate situations where fine-tuning is desired. The adjustments are made using potentiometers located under the front panel label and are non-interactive for ease of use.